I’m always trying to make recipes better. I find that there are lots and lots of wonderful recipes out there, but when it comes to baked goods, most people give up and succumb to the white flour, white sugar, butter/margarine/oil onslaught that fills shelves and stomachs with so much processed crap. This is not to say that I am perfect; far from it. But I do strive to do better, and for this recipe that I first created about a month ago, I set out to build a banana muffin that was not a processed food bomb and was healthier than 99% of the recipes out there but also tasted great. I started with what I thought was an okay recipe from a cooking website called The Spruce, basic vegan banana muffin recipe, that Suzanna ran across when searching recipes online. But then I saw that it uses white flour, sugar, and oil or margarine. Wow, I thought, I am sure I can do better because I had been making smoothies for years with dried dates and had recently had some successes with using avocado in some baked goods. So began my better muffin journey and it’s been a great ride. The recipe I have come up with is also a very simple recipe to make. And it works well with variations (see below). It takes about 15 minutes to prepare and another 25 minutes to bake. So you can go from start to eating in about 45 minutes. Each muffin is only 121 calories, is made exclusively from plant-based foods (i.e., is vegan), is made with 100% whole wheat, and packs 5 grabs of natural oat bran fiber! Furthermore, the recipe uses no phony overly processed foods with all the micronutrients stripped out, and no phony artificial sweeteners. And with only 5 grams of natural whole-food-based sugar in each muffin, this muffin won’t spike your blood sugar. Plus it tastes great. Preheat oven to 360 Fahrenheit. This I got from the spruce recipe and have stuck with. It seems to work well. Grab a muffin tin, put liners into all 12 holes and spray with some non-stick cooking spray or rub with a small amount of coconut oil, or, if you don’t mind the muffin sticking to the liners, don’t use any oil/spray. I’ve done it with and without the oil spray and have to admit I enjoy the muffin just popping out of the liner. I think the oil absorbed by the muffin is negligible. Place the pitted dates and a 1/4 cup of water into a high speed blender (e.g., Vitamix) or food processor and run it until it chops up the dates into tiny pieces. scrape the sides. Add the avocado and bananas and another 1/4 water and run the blender until it makes a nice goopy slurry. About a minute. You may need to interrupt and scrape the sides occasionally. Oh, and you know all those banana muffin/bread recipes that insist that you must use over-ripe bananas: they’re all wrong. I have used everyday bananas at no great loss. So use the over-ripened bananas if you have them but don’t sweat it if your nanas are a little under-ripe. In a separate bowl, add the dry ingredients and stir with a fork until well combined. Now add the wet contents of the blender into the dry ingredients and combine well. At this point, I strive for a goopy batter that is easy enough to scoop into the muffin tins. For me, I usually add another 1/4 cup of water so that it has the right consistency. Add the batter to each muffin tin with a spoon. I find a 1/4 cup measure works pretty well. Try to even them out but don’t worry too much about them all being the same level. Bake in the oven for about 25 minutes. You want to strive for a nicely browned muffin that, when a toothpick is inserted comes out mostly clean. Cook less, if you prefer a moister muffin or more, if you prefer a drier muffin. Place on a cooling rack. Try to wait for just a few minutes before grabbing one and devouring it. But don’t fret, it’s only 121 calories! This version of the muffin is only 121 calories per muffin, give and take a few calories based on your exact ingredients. I say this because we buy a lot of stuff bulk and the nutritional profile does vary from vendor to vendor. Thanks to MyFitnessPal’s recipe calculator, here is the complete nutritional profile and a nice photo of one of the muffins in my hand. Yum! Increase/decrease the amount of oat bran while decreasing/increasing the amount of whole wheat flour. 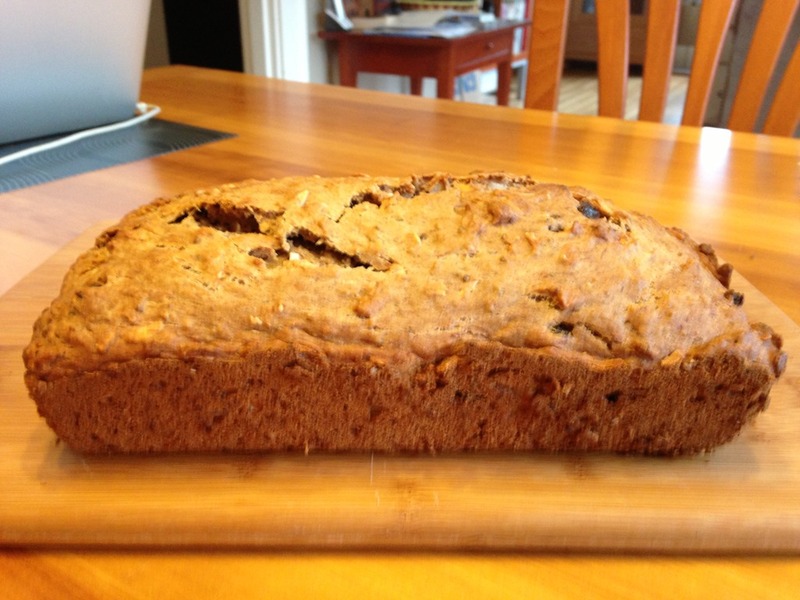 Substitute prunes for dates. Also, if you like your muffins sweeter, you may want to increase the number of dates/prunes but I find 5 works well for us. 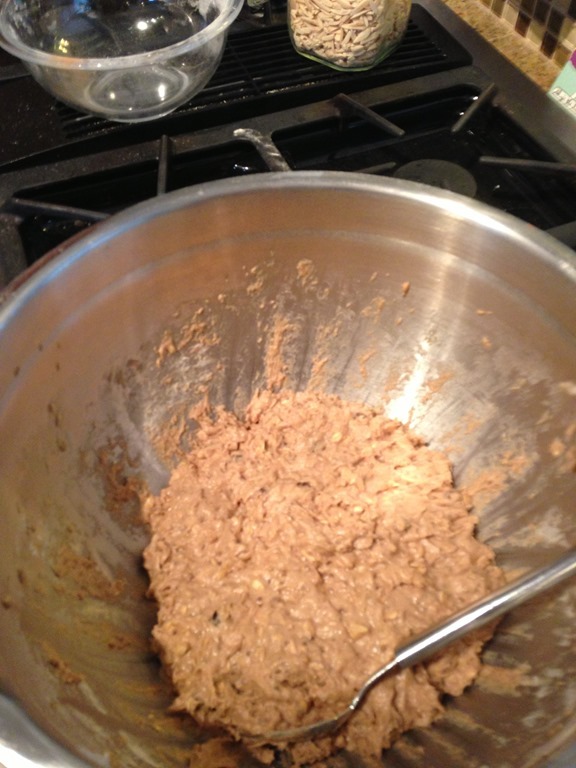 Add a nut such as pecans or almonds. Add different seeds such as pumpkin. Remove the coconut and/or chia seeds. You might need to adjust the amount of added water depending on the ingredients you use. Feel free to experiment, and please keep it whole food as much as possible (the concept, not the grocer; support your local grocer or food coop). And please, try to keep processed sugar and oil out of the recipe, if at all possible. This post is part of the Virtual Vegan Potluck, held on November 16, 2013. At the bottom of the post, you will find links to the previous and next recipe posts in the Virtual Vegan Potluck. Enjoy! Here is a link to the beginning of the potluck posts. Paul and I recently became vegan. 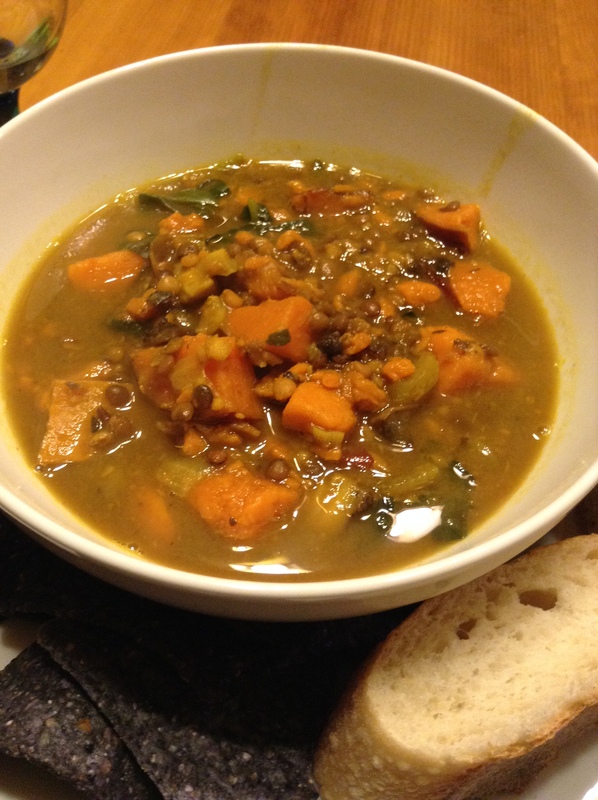 Not too long ago, Paul requested some lentil soup. I rooted around online and adapted a recipe I found somewhere. This is my adaption. It makes for a great fall or winter meal. For us, this soup meets all our needs: it’s easy to make, wonderfully delicious, and naturally vegan. That is, it’s vegan without really trying since it’s all vegetable-based. We hope you like it as much as we do. A bowl of this delicious soup. Add the olive oil to a big soup pot. Saute the chopped onion in the olive oil. 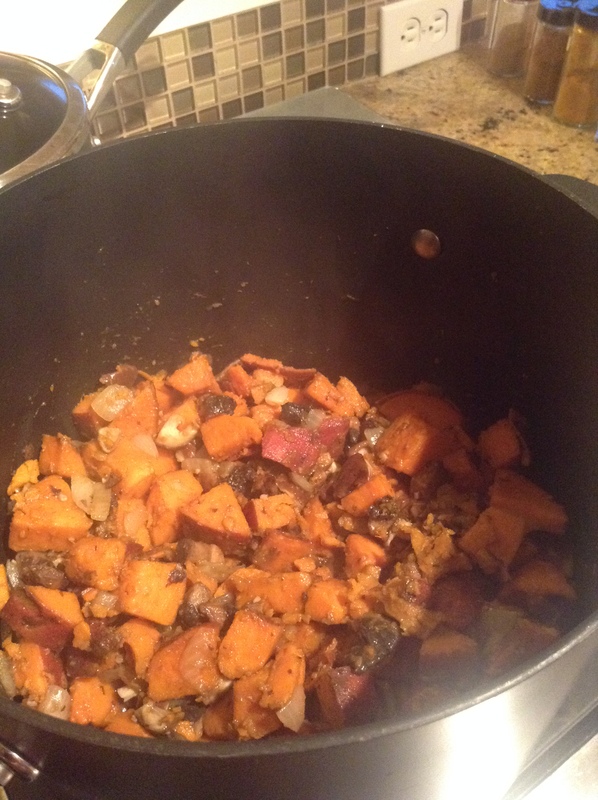 After a few minutes, add chopped sweet potato to the pot. Being careful not to burn it, add the garlic and continue to saute until the potatoes are soft. 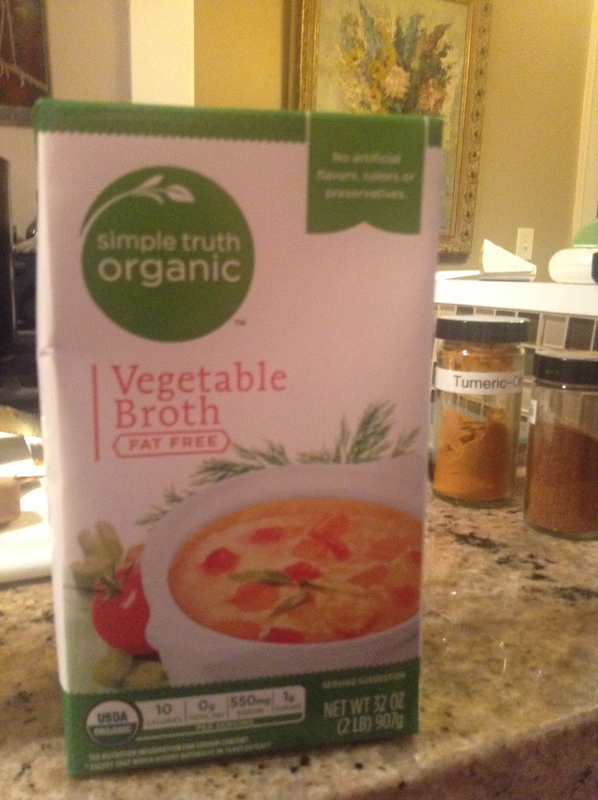 The secret that makes this recipe very quick and easy is to use a package of steamed lentils from Trader Joe’s. Now I usually shy away from pre-fab food, but these are minimally processed and really make life easier when dealing with lentils. Of course, you can substitute cooked dried lentils if you prefer. Simmer for 15 minutes or so. Serve in bowls with some crusty bread. 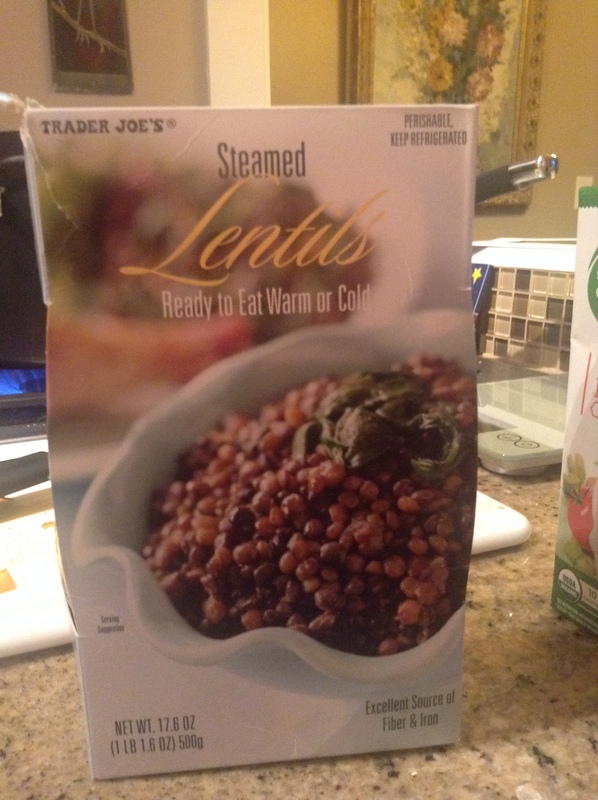 Trader Joe’s Steamed Lentils box. 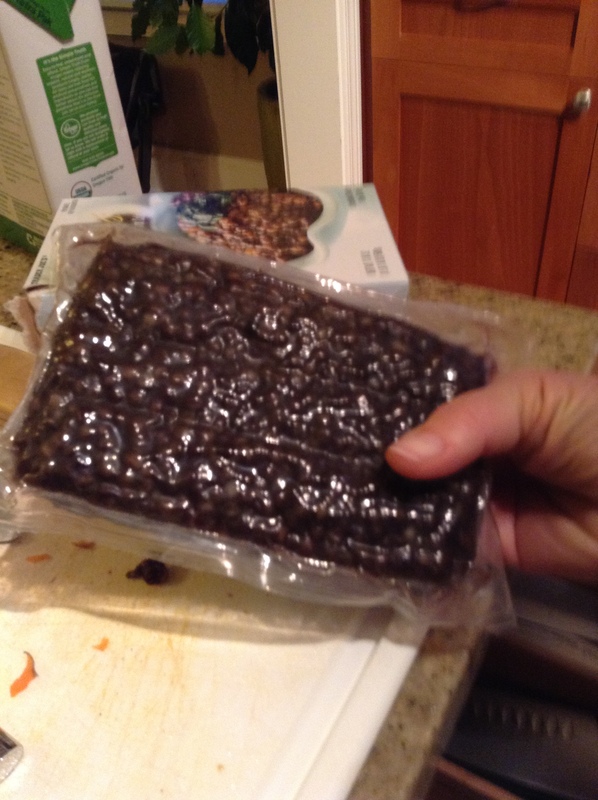 The bag of lentils inside the box. Sautéing the sweet potato, onions, and garlic. This post is part of the Virtual Vegan Potluck, held on November 16, 2013. You can use the images above to navigate to the previous and next recipe posts in the Virtual Vegan Potluck. Here is also a link to the beginning of the potluck posts. Enjoy! Suzanna and I are excited to be part of our first Virtual Vegan Potluck. You can read about it at this link but come back and see our post on a delicious soup as well as links to all the other participting posts (there are 146 wonderful vegan potluck recipes from all over the world) just after midnight (or as soon as you wake up) on November 16 (eastern standard time)! 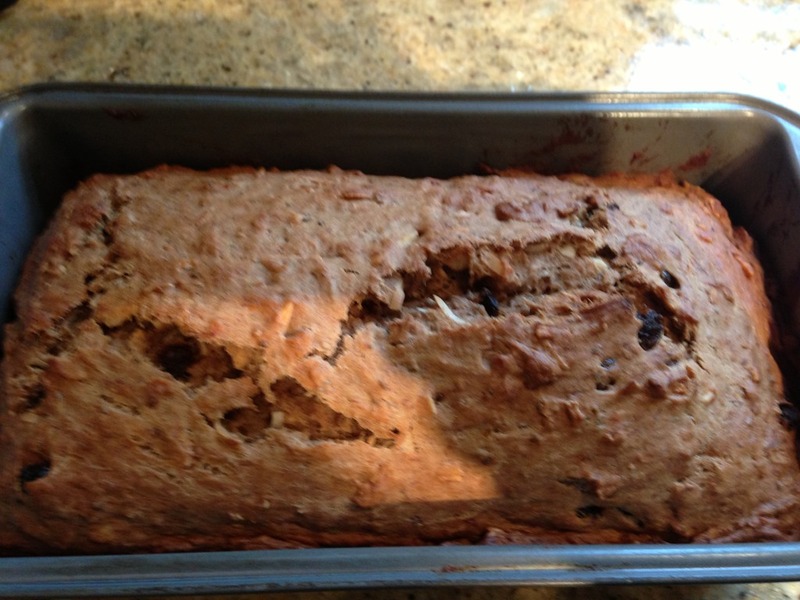 A few weeks ago I spotted too many darkening bananas on the counter and decided it was time to make some banana bread. A quick search of recipes using SpringPad on my iPhone located this recipe by Emily Malone on the Dailly Garnish site. I have modified this already vegan recipe somewhat. My goals were two-fold: make it healthier, make it tastier, and make it from ingredients already in the kitchen. Okay, that’s three goals. Thank you Emily for a fantastic recipe. You can, of course, choose to follow the original version or my version or make up your own variation. 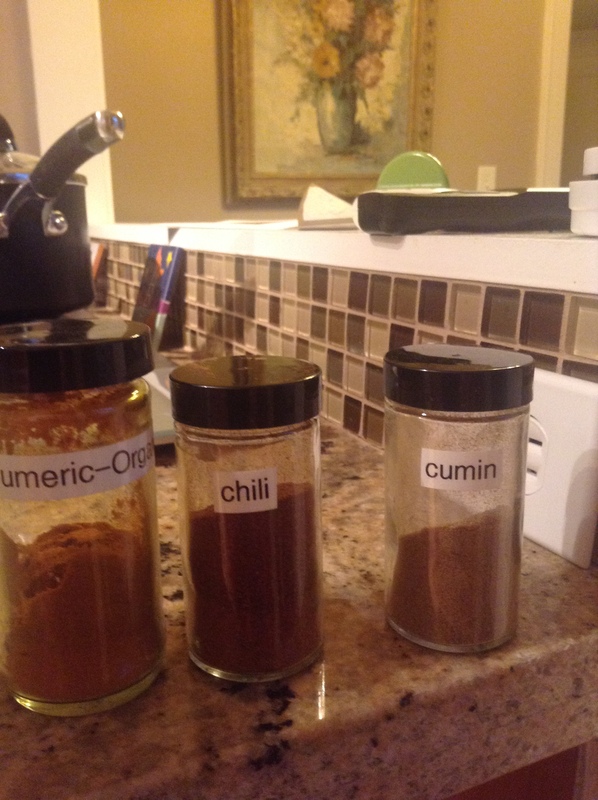 I’ve italicized ingredients that are not in Emily’s recipe, as well as measurements that differ from Emily’s recipe. Also worth mentioning: as much as possible, I try to use organic ingredients. Add the chia seeds to a one-cup glass measuring cup and a 1/4 cup cold water. Stir. Wait around 15 minutes until the chia seeds absorb a significant amount of water to form a gel. In a large mixing bowl, combine the brown sugar, maple syrup, coconut oil, and chia gel. Using an electric mixer, beat the ingredients for a few minutes until well combined. In another one-cup glass measuring cup (or perhaps you could simply clean the cup in which you made the chia gel), add the teaspoon of apple cider vinegar to the non-dairy milk. (I’ve used both soy and almond with good results.) and stir. This concoction makes a non-dairy version of buttermilk. Add the milk and vinegar solution to the mixing bowl along with the vanilla and mashed bananas. Beat with the mixer for a few more minutes. In a separate bowl, combine the remaining dry ingredients and mix together with a fork. Slowly add the dry ingredients to the wet ingredients and mix until combined well. Don’t over-mix. The mixture before placing it in the loaf pan. Grease a loaf pan with a little olive oil and a paper towel. Pour the bread mixture into the loaf pan, leveling it as much as possible. Bake in the oven at 350 degrees for about 50 minutes. Check the bread by inserting a knife into the middle of the loaf until it reaches the bottom of the pan and withdraw it. The knife should be pretty clean; that is, no wet batter stuck to it. Fresh out of the oven. The smell is wonderful! Let sit on a cooling rack for about 5 minutes. Run a knife around the edges of the loaf to separate it from the pan. Bang the pan on the counter a few times and turn it over, the loaf should come out pretty easily. Let the loaf cool on a cooling rack. If you’re like me, you won’t be able to resist slicing off a piece while it’s still warm. Enjoy. The finished product right before the first slice was made. What’s so great about the recipe is that it uses whole wheat flour, a relatively small amount of sweeteners, and is vegan without really trying that hard. We love it anyway!